Evidence has confirmed the influence of peer group and the effect of parental knowledge and quality of family relationships in the development of antisocial behaviour and delinquency in youth (e.g., Derzon, 2010; Farrington, Ttofi, & Coid, 2009; Guillén, Roth, Alfaro, & Fernández, 2015; Hoeve et al., 2009). Moreover, research has demonstrated that parenting practices and peer group interact and jointly influence the development of antisocial and delinquent behaviours (e.g., Collins & Laursen, 2004; Trudeau, Mason, Randall, Spoth, & Ralston, 2012; Véronneau & Dishion, 2010). Specifically, several studies have found that certain parenting practices were indirectly related to antisocial behaviour through the mediation of deviant peers (e.g., Deutsch, Crockett, Wolff, & Russell, 2012; Haggerty, Skinner, McGlynn-Wright, Catalano, & Crutchfield, 2013; Pardini, Waller, & Hawes, 2015). Among other parenting practices, research has found that low levels of parental knowledge, low levels of parental support, and high levels of parent-youth conflict were directly and indirectly related to antisocial behaviour by increasing adolescent affiliation with a deviant peer group (e.g., Andrews & Hops, 2010; Ryzin, Fosco, & Dishion, 2012; Sitnick, Shaw, & Hyde, 2014). However, the role of these social factors is not static, but changes through adolescent development. While adolescent autonomy and independency is being established, the influence of family context decreases and the influence of peer group rises (e.g., Cleveland, Feinberg, Bontempo, & Greenberg, 2008; Collins & Steinberg, 2008; Nurmi, 2004). Although the level of parental knowledge seems to remain relatively stable over the course of adolescence (e.g., Laird, Criss, Pettit, Bates, & Dodge, 2009), the manifestation of closeness in parent-adolescent relationships decreases and the presence of parent-adolescent conflicts increases especially in early-adolescence (e.g., Collins & Laursen, 2004; Collins & Steinberg, 2008). Overall, the level of conflict in parent-youth relationships is reduced over time and closeness recovers in late-adolescence (e.g., Collins & Laursen, 2004; Collins & Steinberg, 2006). Therefore, the effects of parental knowledge, parental support, and parent-adolescent conflict on the involvement in antisocial behaviour appear to be especially influential in early adolescence. On the other hand, research has suggested that friendships remain stable throughout adolescence. However, generally peer interactions seem to show great influence on antisocial behaviour in middle- and late-adolescence (e.g., Dodge, Coie, & Lynam, 2006; Rubin, Bukowski, Parker, & Bowker, 2008; Van Ryzin, Fosco, & Dishion, 2012). Regarding this, some studies have found evidence for the socialization process. The socialization process refers to the direct influence of deviant peer group on the adolescent antisocial behaviour, that is, adolescents are involved in antisocial activities influenced by their antisocial peers (e.g., Keijsers et al., 2012; Negriff, Ji, & Trickett, 2011). Other research has found support for the selection process. The selection process reflects the individual disposition to affiliate with similar peers, that is, adolescents with antisocial attitudes and problematic behaviours tend to select friends with similar antisocial characteristics (e.g., de Kemp, Scholte, Overbeek, & Engels, 2006; Hou et al., 2013). Generally, research has proposed the reciprocal and complementary influence of both processes in youth development, and specifically in the development of antisocial behaviour (e.g., Brook, Brook, Rubenstone, Zhang, & Saar, 2011; Burk, van der Vorst, Kerr, & Stattin, 2012; Dishion, Veronneau, & Myers, 2010). Therefore, based on the previous empirical evidence, the main goal of the current study was to verify the presence of mediation effects of parenting practices through deviant peers on youth antisocial behaviour and the presence of differences in these relationships depending on two age cohorts. Thus, the direct and indirect effects of parenting practices (i.e., parental knowledge, parental support, parent-adolescent conflict) and affiliation with deviant peers on antisocial behaviour (both violent and nonviolent) were examined in Spanish community youth in middle- and late-adolescence. An additional objective of the current study was to analyse the presence of the processes of selection and/or socialization influence. In order to examine these processes, a measure of individual propensity towards violence was included in a structural model together with deviant affiliations to evaluate their effects on antisocial behaviours. This measure, composed of hostility and violent attitudes, reflects the individual tendency of adolescents to get involved in violent behaviours and therefore to affiliate with antisocial peers. To the best of our knowledge, no studies in a Spanish sample have previously examined both mediation effects and processes of influence in two age cohorts. It is expected that family exerts more influence on the younger group, deviant affiliations exert more influence on the older group, and both selection and socialization effects are present in the younger and the older group. Therefore, this study specifically proposed the following hypotheses: (1) the effects of parental knowledge, parental support, and parent-adolescent conflict on nonviolent and violent antisocial behaviours are mediated by affiliation with deviant peers; (2) parental knowledge, parental support, and parent-adolescent conflict are direct and indirectly more strongly related to antisocial behaviours in middle-adolescence; (3) a deviant peer group directly influences more strongly antisocial behaviours in late-adolescence; (4) controlling for the presence of individual propensity towards violence, the affiliation with deviant peers is directly related to youth antisocial behaviours supporting the socialization process for both age groups; and (5) the individual propensity towards violence is indirectly related to antisocial behaviours through the affiliation with deviant peers supporting the selection process for both age groups. The sample was composed of 584 Spanish young people from six state high schools of Galicia (NW Spain), 46.9% males (n = 274), aged 14 to 20 (M = 15.99, SD = 1.20), and 53.1% females (n = 310), aged 14 to 19 (M = 15.98, SD = 1.17). The only participant aged 20 was removed from the final study for comparison purposes. The final sample was subdivided in two age cohorts: a younger group (n = 377), aged 14 to 16 (M = 15.27, SD = 0.72), 45.9% males, and an older group (n = 206), aged 17 to 19 (M = 17.30, SD = 0.54), 48.5% males. Accidental sampling was carried out to select state high schools attempting to obtain data from the four provinces of Galicia. Parental knowledge. The degree of parental knowledge about the youth's activities or friendships was measured by a 6-item scale used in previous studies in Spain (Luengo, Villar, Sobral, Romero, & Gómez-Fraguela, 2009; Sobral, Gómez-Fraguela, Romero, Luengo, & Villar, 2012), using a four-point scale from 0 (never) to 3 (always) (e.g., “They know with whom you go out in your spare time”, “They know what you do after school”; α = .80). The lambda coefficients in the structural model were between .38 and .80. Parental support. Parental warmth, responsiveness, and closeness were assessed by an 11-item scale based on the Parental Bonding Instrument (PBI; Parker, Tupling, & Brown, 1979), adapted and used in previous studies in Spain (Pepe, Sobral, Gómez-Fraguela, & Villar, 2008). This scale was scored on a 4-point scale from 0 (never) to 3 (always) (e.g., “They make me feel loved”, “They are affectionate with me”; α = .90). The lambda coefficients in the structural model were between .51 and .81. Parent-adolescent conflict. The presence of conflict in parent-youth relationships was measured by a shortened version of the Conflict Behavior Questionnaire (CBQ-20; Robin & Foster, 1989) used in previous studies in Spain (Cutrín, Gómez-Fraguela, & Luengo, 2015). This version was composed of 7 items and was scored on a 4-point scale from 0 (never) to 3 (always) (e.g., “The talks we have are frustrating”, “We get angry over little things”; α = .76). The lambda coefficients in the structural model were between .43 and .73. Deviant peer group. The presence of antisocial behaviour in the peer group was assessed by a 3-item scale used in previous studies in Spain (Cutrín et al., 2015; e.g., “My best friends get into trouble and problems”, “My best friends take drugs”; α= .71). The items were scored on a 4-point scale from 0 (strongly disagree) to 3 (strongly agree). The lambda coefficients in the structural model were between .53 and .76. Nonviolent antisocial behaviour. This measure was evaluated by three 6-item scales of the Antisocial Behaviour Questionnaire validated and used in previous studies in Spain (ABQ; Luengo, Otero-López, Romero, Gómez-Fraguela, & Tavares-Filho, 1999; Maneiro, Gómez-Fraguela, Cutrín, & Romero, 2017), scored on a 4-point scale from 0 (never) to 3 (very often): a rule-breaking scale (e.g., “Spending the night out without permission”, “Running away from home”; α = .77), a theft scale (e.g., “Taking something from class without permission with the intention of stealing it”, “Stealing materials from people working in a warehouse or a building site”; α = .78), and a vandalism scale (e.g., “Setting fire to something: a dustbin, table, car, etc.”, “Striking, damaging, or scratching parked cars or motorbikes”; α = .86). The global measure presents an internal consistency of α = .78. The lambda coefficients in the structural model were between .68 and .87. Violent behaviour. Violence was assessed by the 6-item physical aggression scale of the ABQ (Luengo et al., 1999; e.g., “Fighting and hitting someone”, “Using some type of weapon in a fight, e.g., knife, stick”; α = .81), scored on a 4-point scale from 0 (never) to 3 (very often). The lambda coefficients in the structural model were between .44 and .84. Propensity towards violence. This variable was assessed by two measures of individual traits associated with propensity to violence: hostility and attitudes towards violence. A 6-item hostility scale based on the SCL-90-R Hostility scale (Derogatis, 2002) used in previous studies in Spain (Arce, Fariña, & Vázquez, 2011; e.g., “I get irritated or angry easily”, “I feel driven to hit, beat or hurt someone”; α = .79), and a 9-item short version of the scale of attitudes towards social aggression elaborated for Spanish population (Moral, 2005; e.g., “To get respect you need to hit somebody occasionally”, “Anyone who uses threats usually gets what he want”; α = .80) were used. Both scales were scored on a 4-point scale from 0 (not true) to 3 (very true). The global measure of propensity towards violence presents an internal consistency of α = .87. The lambda coefficients in the structural model were between .72 and .87. Ethical standards were complied with throughout the investigation. Qualified psychologists presented the study to heads of the school centres, explained the objectives, and provided the proper instructions to the participants. Additionally, consent of adolescents’ parents or legal caregivers was requested. Participation was voluntary, and anonymity and confidentiality of information were totally guaranteed. Statistical analyses were conducted on IBM SPSS Statistics 20, and SPSS Amos 19 was used for the analysis of structural equation modelling. Firstly, an ANOVA was carried out to analyse the differences in all the study variables based on the age cohorts and a MANOVA was conducted to verify these differences controlling for gender. Secondly, an equation model tested the existence of mediation effects of parental knowledge, parental support, and parent-adolescent conflict on youth antisocial behaviours through affiliation with antisocial peers in both groups. Lastly, another equation model tested the existence of mediation effects of propensity towards violence on youth antisocial behaviours through deviant affiliations in an attempt to examine the selection and socialization effects. The Critical Ratio Difference method was used to assess differences between age cohorts. The Maximum Likelihood (ML) method and the goodness-of-fit indexes χ2/df, CFI, TLI, RMSEA, and SRMR were used to estimate the models. The following were considered criteria for an optimum fit: χ2/df < 2-3, CFI > .95, TLI > .95, RMSEA and SRMR< .05; and for an acceptable or reasonable fit: χ2/df < 4, CFI > .90, TLI > .90, and RMSEA and SRMR between .08 and .10 (Arce, Velasco, Novo, & Fariña, 2014; Byrne, 2010; Hu & Bentler, 1999). Table 1 shows descriptive statistics, including means, standard deviations, scale ranges of main study variables, as well as the results of the MANOVA analysis and the effects sizes of age and gender. The ANOVA results indicated significant differences between the younger group (aged 14-16) and the older group (aged 17-19) in the level of parental knowledge, F(1, 517) = 5.983, p = .015, and the level of propensity towards violence, F(1, 567) = 7.104, p = .008. As shown in Table 1, the MANOVA results indicated that only the differences in the levels of parental knowledge and propensity towards violence remained significant once controlled for gender. Effect sizes indicated that individual propensity towards violence was the variable most influenced by age, and violent behaviour and affiliation with deviant peers were the variables most influenced by gender (see Table 1). Descriptive Results of All Study Variables for both Age Cohorts (14-16 and 17-19), MANOVA Results Controlled for Gender, and Effect Sizes Based on Age and Gender. Note. η2 = eta squared effect size; Violent B. = violent behaviour; Propensity = propensity towards violence. The structural equation model of parenting mediated relationships obtained mostly acceptable fit indexes, χ2(1142, 573) = 1.87, p < .001, CFI = .89, TLI = .87, RMSEA = .039 [.037, .042], SRMR = .058, and increased significantly the model fit as compared to the direct model (i.e., mediation by peers is not considered in this model), Δχ2(6, 573) = 93.60, p < .001, ΔCFI = .01, ΔTLI = .01. For the younger group (see Figure 1) the results indicated that parenting practices were significantly related to affiliation with deviant peers, parental knowledge was negatively related and parental support and parent-adolescent conflict were positively related. These relationships explained 30% of the variance of the association with antisocial peers. Parental knowledge was also significantly negatively related to nonviolent and violent antisocial behaviours. Parental support and parent-adolescent conflict were significantly positively related to nonviolent and violent antisocial behaviours. Affiliation with deviant peers was significantly and positively related to nonviolent and violent behaviour. All these relationships explained less than 50% of the variance of the antisocial behaviours, which were strongly correlated. Model of Mediation Effects of Parenting Practices on Nonviolent and Violent Antisocial Behaviours through Affiliation with Antisocial Peers for the Younger Group (aged 14-16). The model shows significant standardized regression coefficients of direct effects, coefficients of determination, and significant correlations between variables. 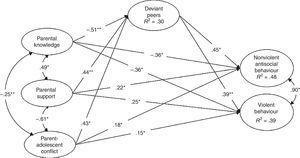 For the older group (see Figure 2) the results indicated that only parental knowledge (negatively) and parent-adolescent conflict were significantly positively related to affiliation with deviant peers, explaining about 30% of the variance of the association with antisocial peers. Parental knowledge was only significantly negatively related to violent behaviour and parental support was only significantly positively related to violent behaviour. Parent-adolescent conflict was not significantly directly related to any antisocial behaviour. Affiliation with a deviant peer group was significantly related to violent behaviour and primarily to nonviolent behaviour. All these relationships explained about 40% of the variance of the violent behaviour and about 70% of the variance of nonviolent antisocial behaviour. Antisocial behaviours were strongly correlated. Model of Mediation Effects of Parenting Practices on Nonviolent and Violent Antisocial Behaviours through Affiliation with Antisocial Peers for the Older Group (aged 17-19). The model shows significant standardized regression coefficients of direct effects, coefficients of determination, and significant correlations between variables. The Critical Ratio Difference method indicated that parental knowledge was significantly more strongly associated with deviant affiliations in the younger group (CR = 2.43, p = .008), and involvement with deviant peers was significantly more strongly related to nonviolent antisocial behaviour in the older group (CR = 2.70, p = .004). Table 2 shows standardized indirect effects for parenting-peers mediated model. For the younger group the results indicated that all parenting practices were significantly related to nonviolent and violent behaviours through the mediation of involvement with deviant peers, especially the level of parental knowledge. Therefore, low levels of parental knowledge and high levels of both parental support and parent-adolescent conflict were associated with the antisocial behaviours through increasing the affiliation with an antisocial peer group. On the other hand, for the older group the results indicated that only parental knowledge and parent-adolescent conflict were significantly indirectly related to nonviolent and violent behaviours, primarily the level of parent-youth conflict. Thus, low levels of parental knowledge and high levels of parent-adolescent conflict were related to the antisocial behaviours through increasing the affiliation with antisocial peers. Standardized Indirect Effects of Parental Knowledge, Parental Support, and Parent-Adolescent Conflict on Nonviolent and Violent Antisocial Behaviours through Affiliation with Deviant Peers for both Age Cohorts. Note. CI = confidence interval. Lastly, the structural equation model of propensity towards violence peer mediation also obtained acceptable fit indexes, χ2(132, 573) = 3.00, p < .001, CFI = .93 RMSEA = .059 [.053, .066], SRMR = .040. As shown in Figure 3, the results indicated similar effects for both age cohorts. The individual propensity towards violence was positively and significantly related to affiliation with deviant peers, nonviolent and violent behaviours. Deviant affiliations also were positively and significantly related to nonviolent and violent behaviours. This relationship with nonviolent antisocial behaviour was stronger for the older group (CR = 1.87, p = .031). Propensity towards violence showed stronger relationships with violent behaviour, and deviant peers with nonviolent antisocial behaviour. On the other hand, the results indicated significant mediation effects of propensity towards violence on both antisocial behaviours through increasing the affiliation with antisocial peers (see Table 3). Thus, propensity towards violence was strongly related to affiliation with deviant peers, which in turn was directly related to nonviolent and violent antisocial behaviours. 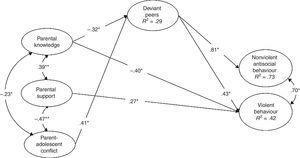 Model of Mediation Effects of Propensity towards Violence on Nonviolent and Violent Antisocial Behaviors through Affiliation with Antisocial Peers. The model shows significant standardized regression coefficients of direct effects, coefficients of determination, and significant correlations between dependent variables. Within the pairs, coefficients on the left side of the slash correspond to the younger group (aged 14-16) and the coefficients on the right side of the slash correspond to the older group (aged 17-19). Standardized Indirect Effects of Individual Propensity towards Violence on Nonviolent and Violent Antisocial Behaviours through Affiliation with Deviant Peers for both Age Cohorts. The aim of the current study was to verify the presence of mediation effects of parenting practices (i.e., parental knowledge, parental support, parent-adolescent conflict) through deviant peers as well as the presence of differences in their effects on youth antisocial behaviours in two age cohorts. Moreover, the current study attempted to analyse the presence of the processes of selection and/or socialization influence in both age cohorts. Therefore, the direct and indirect effects on antisocial behaviour (i.e., nonviolent antisocial behaviour, violent behaviour) and the selection or socialization processes were examined in Spanish community youth in middle- and late-adolescence. The results found in the current study supported the hypotheses proposed. Firstly, the effects of parental knowledge, parental support, and parent-adolescent conflict on nonviolent and violent antisocial behaviours were significantly mediated by affiliation with deviant peers for both age cohorts, except in the case of parental support for the older group. In line with previous research (e.g., Deutsch et al., 2012; Pardini et al., 2015; Sitnick et al., 2014), the current study confirmed the presence of significant mediation effects in middle- and late-adolescence. Thus, low levels of parental knowledge, high levels of parental support, and high levels of parent-adolescent conflict were indirectly related to antisocial behaviour through increasing adolescent affiliation with a deviant peer group (e.g., Andrews & Hops, 2010; Haggerty et al., 2013; Van Ryzin et al., 2012). Surprisingly, parental support was direct and indirectly positively related to both affiliating with deviant peers and involvement in antisocial behaviour. However, this counterintuitive finding is consistent with other research that found a positive influence of parental support on the development of substance use and delinquent behaviours (e.g., Cutrín et al., 2015; Marshal & Chassin, 2000; Tilton-Weaver, Burk, Kerr, & Stattin, 2013), perhaps because youngsters may interpret high support as overprotection, permissiveness, or reinforcement of their antisocial behaviours (e.g., Cutrín, Gómez-Fraguela, & Sobral, 2016; Hoeve et al., 2009; Walker-Barnes & Mason, 2004). Secondly, the findings supported the hypothesis about the stronger effects of parenting practices on antisocial behaviours in middle-adolescence. Parental knowledge, parental support, and parent-adolescent conflict showed more significant relationships and were more strongly related to both antisocial behaviours for the younger group. Thus, as other research has suggested, the lack of parental knowledge and the lack of closeness in family relationships appear to be specifically risk factors in younger adolescents (e.g., Cleveland et al., 2008; Collins & Laursen, 2004; Collins & Steinberg, 2008; Nurmi, 2004). On the other hand, for the older group the direct relationships between the three parenting practices were only significant regarding violent behaviour. In that regard some research has suggested that low parental knowledge and poor family management are related to more violent and chronic antisocial behaviours (e.g., Herrenkohl, Hill, Hawkins, Chung, & Nagin, 2006; Silva & Stattin, 2015). Moreover, parent-adolescent conflict was the variable most strongly related to antisocial behaviour in an indirect way for the older group, especially to nonviolent behaviour. Some authors have proposed that although the frequency of parent-youth conflicts may decrease throughout the adolescence, levels of anger and hostile feelings emerged from the conflict increase over time (Collins & Steinberg, 2008). Thirdly, although the frequency of deviant affiliations did not present significant differences between age groups, being involved with a deviant peer group was more strongly directly related to antisocial behaviour in late-adolescence, especially to nonviolent antisocial behaviour (e.g., Dodge et al., 2006; Rubin et al., 2008; Van Ryzin et al., 2012). As other research has found, deviant affiliations and peer deviance training influence both antisocial development and more specifically covert antisocial behaviour (e.g., Snyder, Schrepferman, Bullard, McEachern, & Patterson, 2012). Nevertheless, affiliation with deviant peers was the variable most strongly related to violent behaviour, especially in the older group. Based on previous longitudinal research, these findings support the role of deviant peers in the cascading progression to more chronic and violent antisocial patterns (e.g., Dishion et al., 2010; Farrington et al., 2009; Henry, Tolan, Gorman-Smith, & Schoeny, 2012). Lastly, the results also supported the fourth and fifth hypotheses about selection and socialization processes. Individual propensity towards violence was strongly related to affiliating with deviant peers and even more strongly related to deviant affiliations than to youth antisocial behaviour. Moreover, propensity towards violence was significantly mediated by these deviant affiliations, that is, adolescent propensity towards violence was indirectly related to nonviolent and violent behaviour through increasing the affiliations with antisocial peers. These findings might be reflecting a selection process. As other studies have suggested, the individual disposition of adolescents to be involved in antisocial behaviour may lead them to seek similar friendships (e.g., de Kemp, Scholte, Overbeek, & Engels, 2006; Hou et al., 2013). On the other hand, affiliation with deviant peers was significantly and directly related to nonviolent and violent antisocial behaviour controlling for the presence of propensity towards violence. The association between deviant affiliations and nonviolent behaviour was stronger for the older group. These results might be showing a socialization process and a direct influence of deviant peers in the adolescent involvement in antisocial behaviour, as other research has proposed (e.g., Keijsers et al., 2012; Negriff et al., 2011). Therefore, the findings supported the reciprocal and complementary influence of both processes in the youth antisocial behaviour, as previous research has found (e.g., Brook et al., 2011; Burk et al., 2012; Dishion et al., 2010). In conclusion, the mediation effects of parenting practices on nonviolent and violent antisocial behaviour through affiliating with antisocial peers were confirmed in middle- and late-adolescence. In line with previous evidence (e.g., Cleveland et al., 2008; Collins & Steinberg, 2008; Nurmi, 2004), family factors presented more significant influence for younger adolescents whereas deviant peers strengthened their influence on older adolescents. Overall, these transversal findings appear to support the longitudinal evidence about the reciprocal influence of selection and socialization processes in the youth development of antisocial behaviour (e.g., Brook et al., 2011; Burk et al., 2012). All these findings point out the need for early interventions to prevent the onset of antisocial developmental patterns. Some research has suggested that protective factors have a greater presence in middle-childhood and that risk factors tend to be more prevalent during adolescence (e.g., Loeber, Burke, & Pardini, 2009). Therefore, given the stronger influence of parenting practices in the younger group, intervention programs during childhood and early-adolescence should be focused on strengthening parenting skills and improving family management. These early intervention programs have shown being effective in preventing and reducing problem behaviour and antisocial manifestations (e.g., Graaf, Speetjens, Smit, de Wolff, & Tavecchio, 2008; Robles & Romero, 2011; Smith, Knoble, Zerr, Dishion, & Stormshak, 2014). Moreover, the evidence of mediated relationships suggests that early interventions focused on parenting skills might reduce or buffer the affiliation with antisocial peers. On the other hand, given the stronger effects of deviant peers on the older group, intervention programs during adolescence should be based on strengthening adolescent assertiveness and resistance to peer pressure as well as improving problem solving skills. Finally, the current study presents some limitations that should be taken into account for the proper interpretation of the results. Firstly, a transversal design and cross-sectional data prevent proving causal relationships. Future longitudinal research is needed to confirm the mediation effects as well as verify the directionality of relationships in the selection and socialization processes. Secondly, the existence of reciprocal and bidirectional effects among the variables was not examined; therefore, further studies should analyse this issue. Thirdly, the results may be partly influenced by shared method variance, given that all the measures in this study were based solely on youth's self-reports. Likewise, other measures of parenting practices (e.g., communication, permissiveness) should be included in future studies. Fourthly, further research is needed to analyse the personality and individual factors that may be moderating the relationships between the variables. Finally, specific risk profiles for nonviolent antisocial behaviour and violent behaviour should be analysed according to age, especially focussing on the early years of adolescence. To sum up, future longitudinal research should overcome these limitations including various sources of information to delve into the comprehension of adolescent antisocial behaviour and improve the effectiveness of specific prevention programs in community youth. This study was supported by the Subdirección General de Proyectos de Investigación (Ministerio de Economía y Competitividad, Gobierno de España) under Grants PSI2011-29704-C03-01 and PSI2015-65766-R and the Programa de Axudas á etapa predoutoral da Xunta de Galicia (Consellería de Cultura, Educación e Ordenación Universitaria).